Are you a crazy cat man or woman and are you single? If you are then this t-shirt is just what you need. On the shirt it says in big letters “SINGLE” and below it a smaller banner that says “With Cats”. So now you can tell the world that you are looking from someone who likes you and cats. You can get this single with cats t-shirt in men and women’s styles in sizes Small – 6XL and in many fun colors. 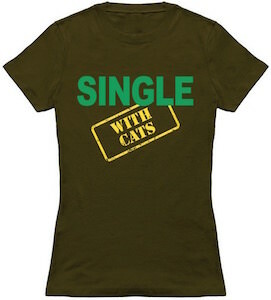 No need to be embarrassed because lots of people are single and have cats and maybe this t-shirt can help you fin a fun likeminded cat person.